With more than 20 million passenger count, on any given day, Indian Railways is one of the busiest rail networks in the world. convenient in the country. If you are a regular passenger, here are top 4 must-have smartphone apps for you. The most popular Indian Railways app is the official IRCTC Rail Connect app. 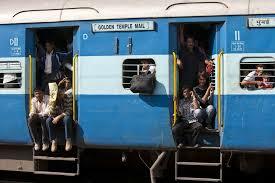 The app lets users book train tickets for various quotas, in a hassle-free and systematic manner. It also features boarding point change facility, option to check booking status, and cancellation of previously booked tickets. Boasting of a user-friendly interface, the app has more than 10 million downloads on the Play Store. NTES (short for National Train Enquiry System) is the go-to app for Indian Railways passengers for planning and managing train journeys. It lets users spot their train location, check train schedules, station information, all in real-time. Additionally, information regarding canceled, rescheduled, and diverted trains can also be known. Users can also use the app to manage 'favorite' trains, stations, and train-schedules. To save passengers the hassle of standing in long queues to get a general ticket from counters, the Indian Railways launched the UTS app. The app allows passengers to book tickets within a radius of 25-30 meters from the railway station. Using the app, a person can book upto 4 tickets. Other than normal tickets, one can also book platform tickets and monthly passes. In order to make catering experience for railway passengers more convenient and enjoyable, IRCTC launched the Food on Track app. The app lets you order your favorite food from local restaurants, right from a railway station. Other features include food-search by PNR, easy cancellations, and OTP verification. Order payments can be made via cards or cash, as per the user's choice.